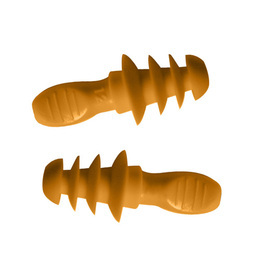 Radians Resistors™ 27 Reusable Ear Plugs feature three flanges for a secure and comfortable seal. The generous handle makes insertion, removal and compliance checks simple and easy. One of the toughest reusable ear plugs available. Also available in corded. Radians Resistors™ 27 Reusable Ear Plugs (NRR 27)5GlennJuly 16, 2016Wow what a pair of ear plugs. I was using the yellow cheap ones on my Motorcycle. now i am getting lots less noise and a cleaner more comfortable fit. Buy these. Radians Resistors™ 27 Reusable Ear Plugs (NRR 27)1Debbie WMay 13, 2014I am so disappointed. These ear plugs are way too big for me. I can't event fit them into my ears. They may be good for people with a larger bone structure, but for me they are useless. Radians Resistors™ 27 Reusable Ear Plugs (NRR 27)4JimNovember 19, 2013They are a good well-made product, but they are a bit larger than I had hoped for. Just a little too big. The exact same style but slightly smaller would be better. Radians Resistors™ 27 Reusable Ear Plugs (NRR 27)5RogerJuly 25, 2013Perfect! Radians Resistors™ 27 Reusable Ear Plugs (NRR 27)4KarenDecember 6, 2011They work but are too big for my ear. They hurt after a while. Need to find ear plugs that come in sizes.